Hi Everyone, it’s Bill and Welcome to The Woks of Life Chinese New Year recipes collections, Past, Present, and growing each year as we add more of our family recipes and other popular Chinese New year recipes to our family recipe collection. The Chinese Lunar New year is a festive time for Chinese all over the world. 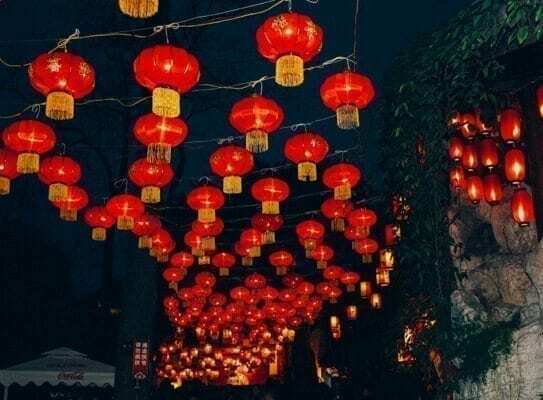 Hanging Lanterns, fireworks,, new clothes, Hong Bao red envelopes filled with money for children, lots of red anything and most importantly, a whole lot of traditional Chinese good food! Here, at The Woks of Life, we can help you with the traditional Chinese recipes and classic Chinese dishes to celebrate your lunar new year. 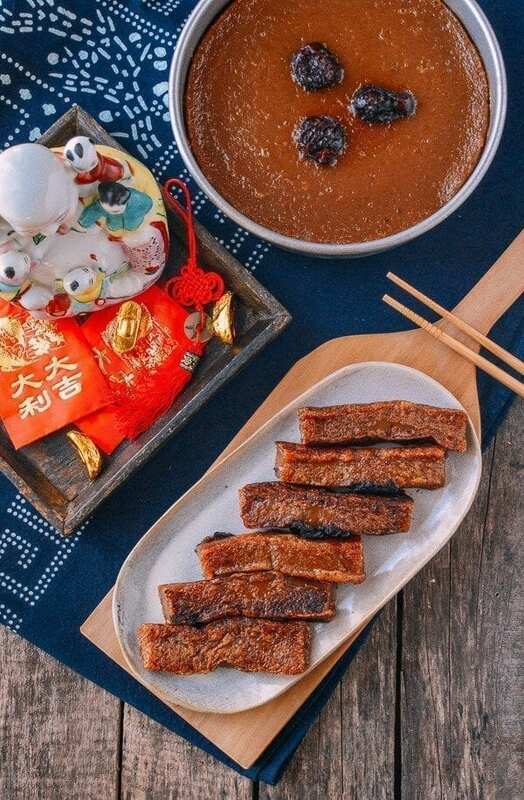 We put together this Chinese New Year Recipes page specifically to help you entertain your family and honored guests during this festive holiday so be sure to come here often and check our Chinese New Year Recipes page before planning your Chinese New Year menu! 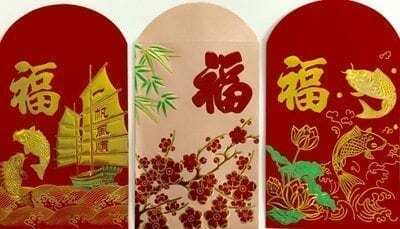 Through the years, we have written articles and recipes about our Chinese New year experiences including various tips on what to do and what not to do so peruse through our collection and you will probably learn something. As you read through our recipe posts, don’t hesitate to leave comments and/or questions because we take your feedback and questions seriously and d our very best to answer each and every one of them! Prawn Crackers for Chinese New Year & Tips on How to Celebrate! Don’t forget your red envelopes for Chinese New Year or your next Chinese Birthday or Wedding Banquet! Start here with your Chinese New Year menu planning! Our collection contains many traditional recipes and food that are typically eaten during Chinese New Year. Each year, we try to add a few new recipe because traditional and classic Chinese New year dishes vary among the different regions of China. We have curated our own list of favorite recipes in several different categories below so take a look-see. If you see something missing that you would like to see, drop us a line and we’ll do our best to produce it. Appetizers, dumplings, snacks, or anything related to rice, glutinous rice or carbs are favorite Chinese New year items. Probably one of the most iconic dishes is the Chinese Sweet glutinous rice cake Nian Gao you see here. 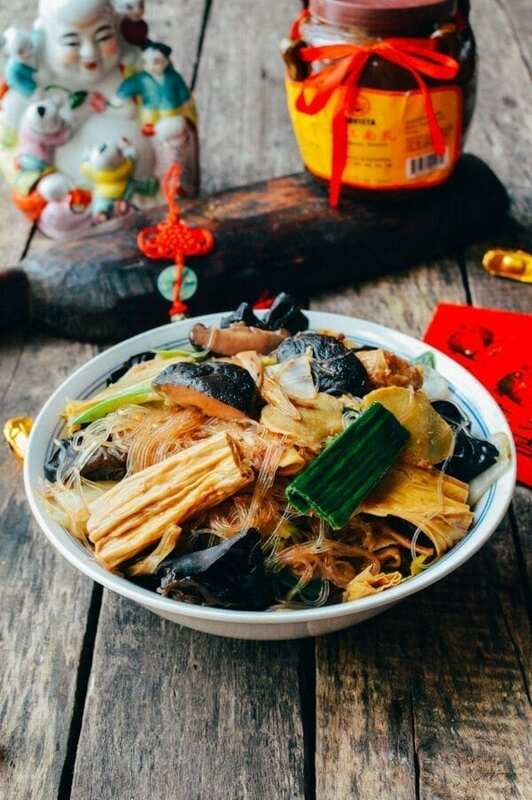 Fish and shellfish are a very popular, if not essential to Chinese New Year and here is our collection of dishes seen often on the Lunar New Year dinner table. 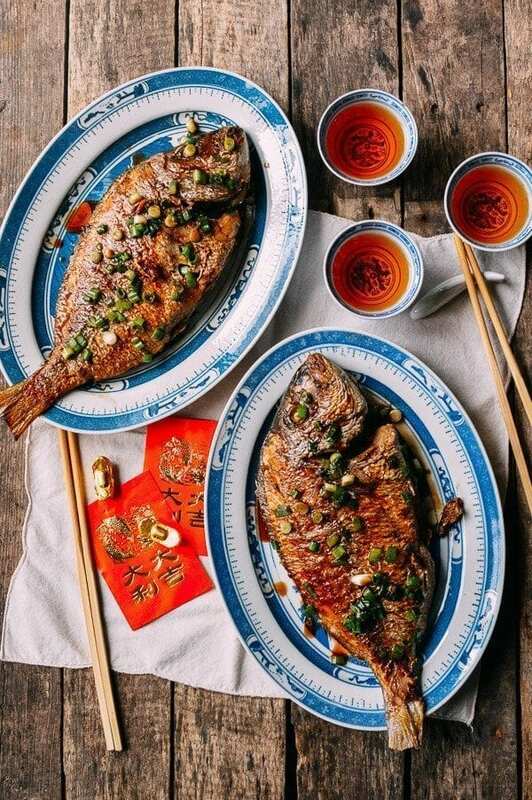 Pictured here is a Pan Fried fish which, of course, there is always two – one to eat at the Chinese New year feast and a second one to leave untouched that day as a symbol of abundance and prosperity for the coming New Year. Poultry and Pork are two favorite meats of the Chinese so no coincidence that Cantonese Poached chicken Bai Qie Ji is one of the most common dishes served on Chinese New year tables. 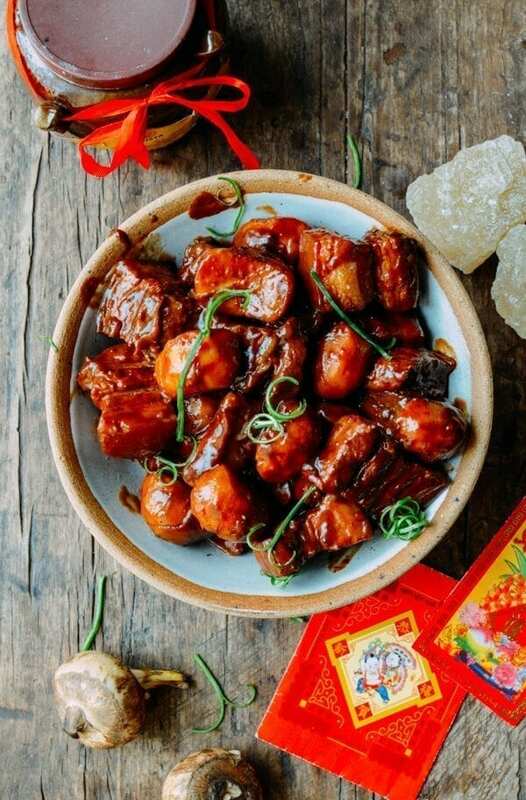 That said, pork belly is also a wildly popular meat among Chinese and this Braised Pork Belly with Arrowroot has a festive red tint and is insanely delicious ! An iconic vegetarian dish is Buddha’s Delight consisting of at least 8 ingredients to make this dish. Very popular among Cantonese, it is eaten the morning of Chinese New year after a ceremonial offering of food on the table to honor and remember family ancestors. 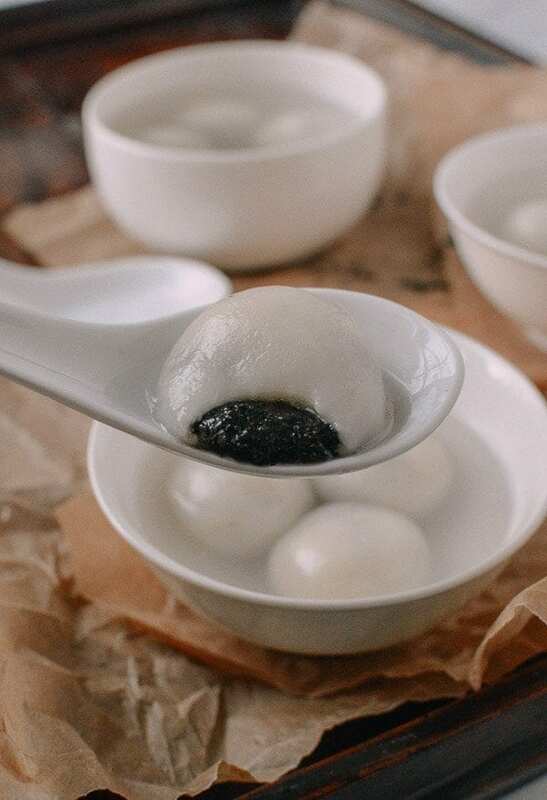 Tang Yuan or Sweet Rice balls with sesame fillings are another iconic Chinese New year treat that is eaten at any time during the day. Fillings for these tasty tang yuan also included ground peanuts, sweet red bean paste and others! You can also check out our Chinese New Year visual recipe index to see thumbnail pictures of these dishes! 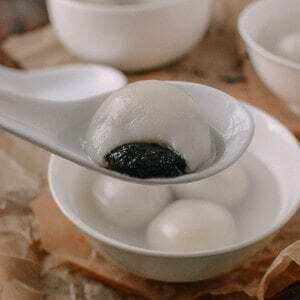 Don’t forget to make your Tang Yuan before the Lantern Festival – official end of the Lunar New Year Festival!